Find out about how you have an oesophageal stent put into your food pipe and how you’ll feel afterwards. 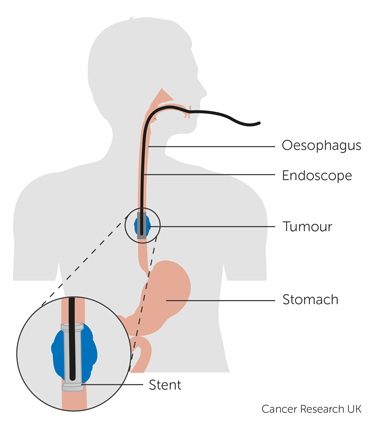 An oesophageal stent is a small metal or plastic tube put into the food pipe (oesophagus). It keeps the food pipe open. A cancer in the food pipe can partly or completely block it and make it difficult to swallow. Putting a stent into the blocked area opens up the food pipe again. This allows you to swallow food and drink more easily. You have the stent fitted in hospital in the endoscopy department or x-ray department. It usually takes about 30 minutes. Your doctor or specialist nurse explains what happens and how they fit the stent. They ask you to sign a form saying that you agree to have the procedure. You can ask them any questions that you have. Tell them about any medicines you are taking. You shouldn’t eat or drink for at least 6 hours beforehand. A nurse puts a small tube called a cannula into a vein in the back of your hand. They go with you to the endoscopy or x-ray department. You have a medicine to make you sleepy injected into the tube in your hand. Or you might have a general anaesthetic. While you are very sleepy or asleep your doctor puts a long flexible tube called an endoscope into your food pipe. It has a light and a small camera on the end so the doctor can see the blockage. They then put the small mesh tube (stent) into the narrowed area. Your doctor passes a fine wire down into your food pipe until it reaches the blockage. You then have an x-ray so the doctor can see the blocked area on a screen. They pass the stent down the wire until it is in the right place. You stay in the endoscopy department or x-ray department until the sedation or anaesthetic wears off. You wear an oxygen mask for a short time. A nurse then takes you back to your ward. You need to stay in hospital overnight or for a few days. The stent expands over a couple of days. This opens up the food pipe so food and drink can pass through again. You can’t eat or drink for the first 2 to 4 hours after having the stent. Your nurse tells you when you can start drinking. Then you can build up to eating soft foods. You need to have a soft diet because solid food won’t pass through the stent. Your dietitian tells you which foods you can eat. Take your time when eating and sit upright. Chew food well and remove any lumps or gristle. If you have dentures, wear them to make chewing easier. Sip nourishing fluids while eating to help food pass down through the stent. Avoid tough lumps of meat, white bread and stringy fruits and vegetables. You might feel some soreness as the stent expands. Taking painkillers for a few days helps. After a few days, the soreness usually goes away but you might still have some soreness at times. Tell your nurse or doctor if you still have pain. Let your nurse or doctor know if you feel sick. They can give you medicines to reduce sickness. You might have some slight bleeding in the food pipe. It might give you a metallic taste in your mouth. This usually gets better over a few days. Your nurse will give you mouthwashes. Tell them if you cough up blood. Damage to the food pipe can tear it or make a hole (perforation). This is very rare. You might need to have surgery to mend the hole if this happens. Your swallowing might change or eating and drinking gets difficult or uncomfortable. Or you may find that you suddenly can’t swallow. After a time, the stent might move and food may not be able to pass through. If this happens you won’t be able to swallow and food or drink will come back up. Your doctor will remove or replace the stent. You have support from community nurses or your local symptom control team. You also have regular appointments at the hospital to check the stent. The hospital or your GP give you any medicines that you need.